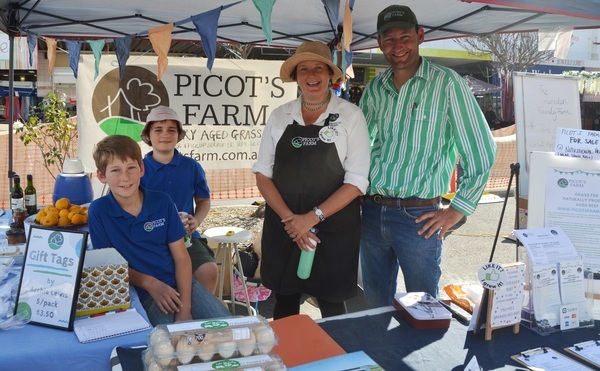 Ian and Helen Lewis with son Archie (left) of Picot''s Farm, and Charlie Palmer of Symara Organic Farm. Jumpers and Jazz Festival-goers got to sample some super local produce during yesterday’s ‘Stroll and Swing’ event in Palmerin Street. The ‘Celebration of Local Flavours’ component of the event was a huge hit with locals and more importantly with city-based visitors to Warwick. Ian and Helen Lewis of Picot’s Farm at Cunningham west of Warwick were among local producers who showcased their top produce at Jumpers and Jazz in 2018. Helen told the Free Times the interaction with city consumers was a terrific opportunity to spread the educative word about how food gets from the farm gate to the metro plate. 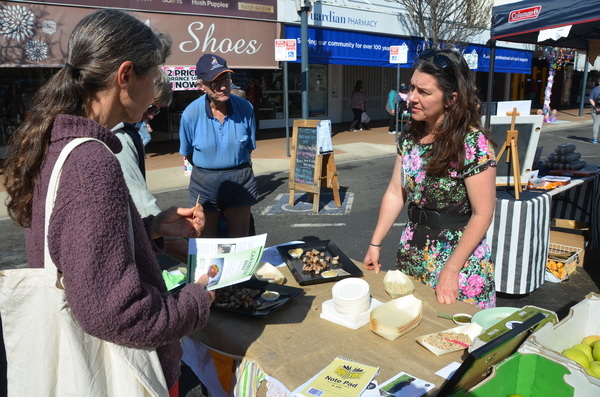 “We had a lot of interest from visitors from places like Ipswich and Brisbane – a lot of good conversations about understanding the ‘lingo’ when it comes to food,” she said. Ian and Helen supply their customers – both local and from out of town – with ‘natural’ hormone-free and grass-fed beef on their 1000-acre Picot’s Farm. The couple handed out a fact sheet with detailed explanations of commonly-used but often misunderstood terms like ‘organic’, ‘free range’ and ‘chemical-free’, along with top tips on how to cook cuts of beef. 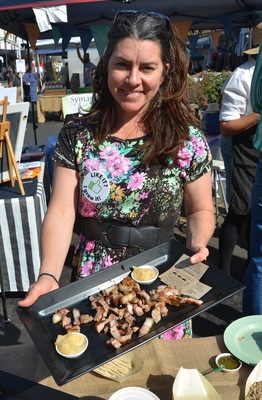 Other producers from around the region who set up stalls at the ‘Celebration of Local Flavours’ included Symara Organic Farm at Pozieres and Gleneden Family Farm at Maryvale. 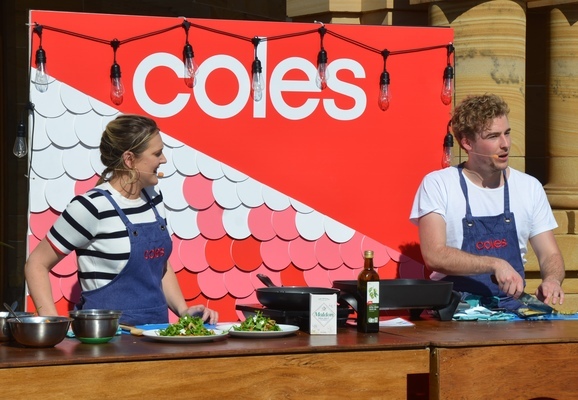 A cooking demo by Sam Goodwin and Mimi Baines from MasterChef outside the Warwick Town Hall featured local produce, including beef from Canning Downs South feedlot and potatoes from Wickham Farms.